PROTOTYPE ENGINES: OLDSMOBILE ‘ROCKET’ SCIENCE! 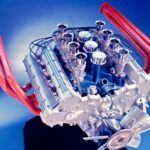 These lightweight multi-carb, four-cam and even Hemi engines were being developed for future production engine research and, in some cases racing projects. 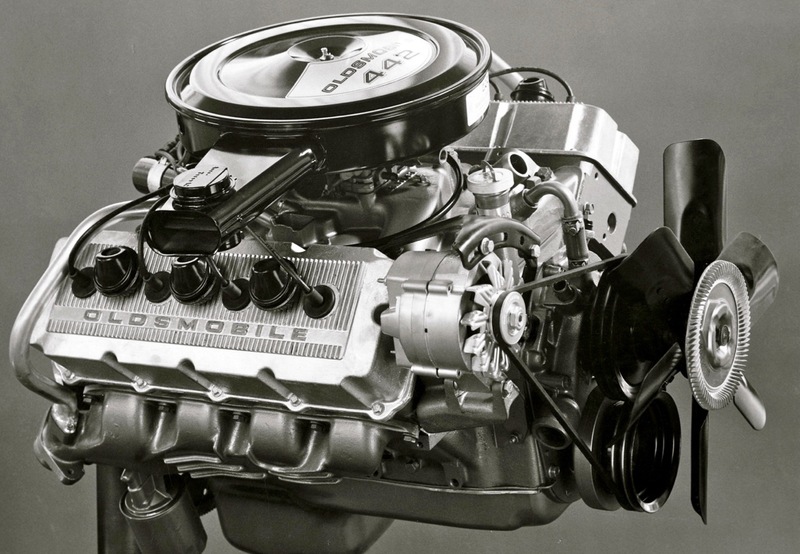 Between 1969 and 1970, Oldsmobile Engineering was responsible for creating powerful ultra-efficient 350 to 455 cubic-inch V-8 engines rated up to 700 horsepower! Some were naturally aspirated and fitted with single Quadrajet four-barrel or Weber carburetors; others were fuel-injected and turbocharged. Most had aluminum blocks and heads. It was hard to imagine that these engines were anything other than veiled attempts at building pure racing engines, but they actually were. Oldsmobile engineering used these engines as prototypes for developing lighter, more fuel-efficient and “cleaner” production engines. 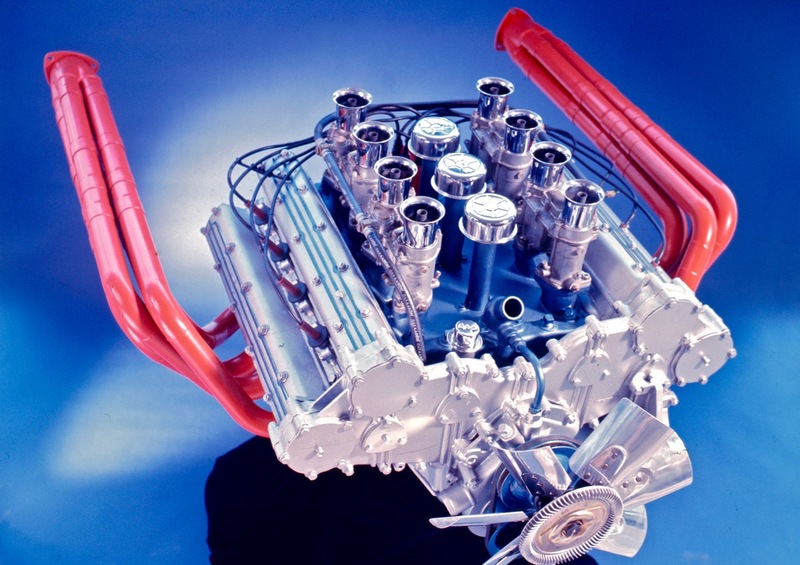 Olds engineers were responsible for the radical OW-43, above, a racing-only, four-cam 455 tested with four Weber carburetors and fuel injection with three-inch ram stacks. The OW-43 was developed at the same time Chevrolet Engineering was working on the ZL1 for Corvette and Camaro applications and Can-Am racing. The OW-43 was tested in a Can-Am racecar, but never used in competition. Based on the same bore-stroke configuration of a production 455, the OW-43 had heads and block with steel cylinder liners cast from Reynolds 356-T-6 heat-treated aluminum. With a redline of just under 8,500 rpm, it produced 600 horsepower at 6,000 rpm with Webers and 700 horsepower at 6,800 rpm with Lucas direct-port fuel-injection. The DOHC prototype had Forged-True 12.20-to-1 pistons, Carillo billet steel rods and a forged steel crank. It weighed 50 pounds less than a production cast-iron 455. 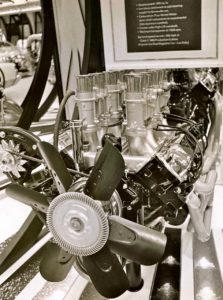 The mildest of the group was an all-aluminum 350 small-block, displacing 389 cubic inches and utilizing dual-throat Weber 48IDA carburetors, above, right. The alloy 389-inch engine ended up in a Cutlass that was driven to the C/Production record at the Bonneville Salt Flats in 1968. A friend and editor at Hot Rod, Lee Kelley, drove a factory-supplied Cutlass 169.133 mph to set the record. Apparently during impound, SCTA officials never detected that the engine was an all-aluminum prototype.The engine in Lee Kelley’s record-setter was a one-off, rated at close to 500 horsepower and built in Lansing by Dave Maurer, a special projects engineer. At Bonneville, the Cutlass was crewed by Maurer along with racing legends, Ak Miller, Jack Lufkin and Ed Iskenderian. 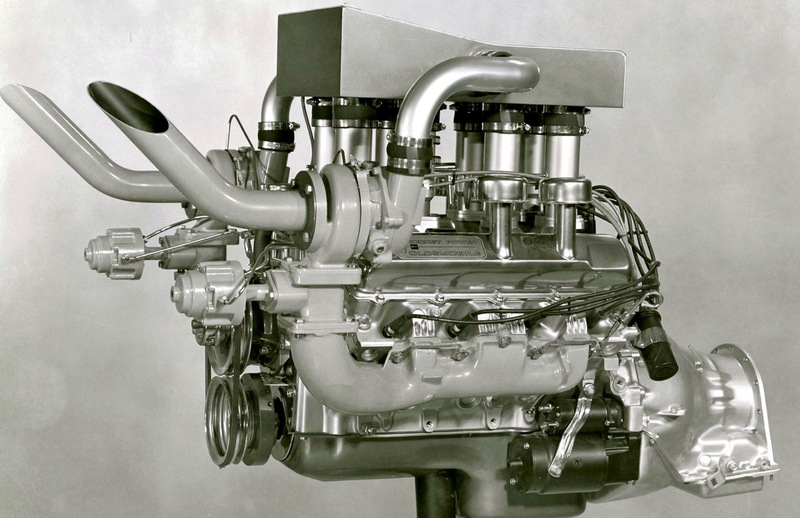 One of the most interesting engines was the 455-inch W-43 Hemi. There were cast-iron and aluminum iterations with four-valve, Hemi-chamber heads. The W-43 engine was designed to be easily converted to chain or gear-driven overhead camshafts. Fitted with a single Quadrajet, it produced in excess of 500 horsepower at 6,500 rpm. The aluminum version weighed 75 pounds less than the then current production 455 engine. This engine found its way into Mule cars tested at the Milford Proving Ground. Oldsmobile engines displacing 389 to 455 cubic inches had powered Can-Am Series cars, like Bob McKee-built Cro-Sal racers in 1967. The highest output Can-Am Olds was an all-aluminum, single-cam 455 with injection and twin turbochargers. It generated 659 horsepower at 6,250 rpm and 554 pound-feet of torque at 6,200 rpm. 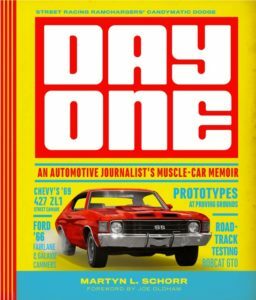 The post PROTOTYPE ENGINES: OLDSMOBILE ‘ROCKET’ SCIENCE! appeared first on Car Guy Chronicles.